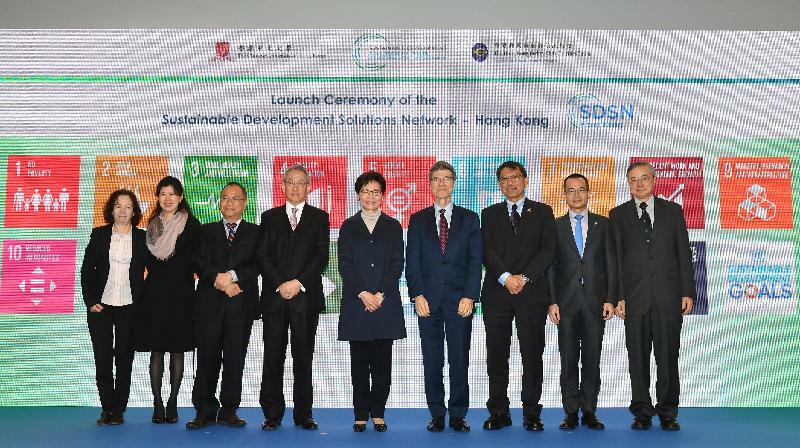 I am delighted to be here today for the launch of the Sustainable Development Solutions Network Hong Kong. It gives me great pleasure to witness the beginning of a vital partnership between the Chinese University of Hong Kong and the Hong Kong Jockey Club Charities Trust, together with member institutions of the Sustainable Development Solutions Network around the world. Since this is my first CUHK function after Professor Rocky Tuan has assumed his position as the Vice-Chancellor and President of this distinguished university, may I wish him best of luck in taking the university to new heights. This partnership responds to a global initiative. The United Nations Sustainable Development Solutions Network has been operating since 2012. It mobilises global scientific and technological expertise to promote practical solutions for sustainable development, including the implementation of the Sustainable Development Goals and the Paris Climate Agreement. It took more than three years of intergovernmental negotiations before world leaders adopt the 17 Sustainable Development Goals, and they represent a cohesive and integrated package of global aspirations the world commits to achieving by 2030. They address the most pressing global challenges of our time, calling upon collaborative partnerships across and between countries. While they cover many aspects, especially they aim to balance the three dimensions of sustainable development - economic growth, social inclusion, and environmental protection. I want to say that my Government is fully committed to sustainable development, and striking a balance amongst the above-mentioned three dimensions has been the underlying rationale for many of my policy initiatives. It is no easy task, but thankfully in recent months our economy has been performing very well and the economic growth for 2017 as a whole is now forecast at no less than 3.7 per cent. Barring abrupt negative shocks, the economic outlook for 2018 remains positive. Coupled with our record-high fiscal reserves, and the many opportunities available to Hong Kong under the two major national initiatives, that is, the Belt and Road and the Guangdong-Hong Kong-Macao Bay Area development, we have less to worry about our economy at the moment. We have now an opportunity and the necessary resources to do more in terms of promoting social inclusion and environmental protection, so as to achieve a better balance of the above-mentioned three dimensions. This is exactly what my Government will do in order to forestall rising sentiments of social discontent, widening income disparity and a growing sense of disconnect, especially between the government and the people, particularly young people. Inclusive growth is highly relevant in the age of globalisation. Economies everywhere must redouble their efforts to advance economic, financial and social inclusion, with a vision to build an inclusive, accessible, sustainable, healthy and resilient community. As a government, we must advance progress towards achieving full, productive and quality employment; and progressively achieve and sustain income growth for all members of society, especially women and youths, persons with disabilities and other vulnerable groups, and enable them to seize global opportunities. Building an inclusive community is, and will continue to be, my Government's priority. In this respect, it is relevant to note that some 60 per cent of our recurrent budget is spent on education, social welfare and medical services. Spending on social welfare and poverty alleviation has surged by 71 per cent in the past five years, with a range of initiatives pioneered by the Commission on Poverty which I chaired in my former capacity as the Chief Secretary for Administration. We will enhance the standard of living for all members of the community, so that they can feel the benefits brought by economic growth. We will continue to inject the needed resources in areas ranging from education and training to social security and medical services, and will lower the profits tax rate for small and medium enterprises. These measures will enable society to better adapt to the changing economic development. And as a responsible global citizen, Hong Kong will play its part in protecting our environment. Among the challenges we face, perhaps none is greater than climate change. Rising sea levels and extreme weather events assault us on an increasingly frequent basis. Taking place everywhere, their impacts are seemingly inescapable. That reality was brought home last summer when Hong Kong was repeatedly struck by severe tropical cyclones. The storm surge induced by Typhoon Hato injured at least 129 people, felled some 5 300 trees and caused serious tidal back-flow in some low-lying areas. And, no doubt, climate change will lead to an increasing and continuing rise in sea levels. The Paris Agreement, which came into force 13 months ago, applies to Hong Kong as well. And we have accorded top priority to meeting the commitments formalised under the Agreement. Indeed, we established a high-level Steering Committee on Climate Change in 2016. I chaired the Committee in my then capacity as Chief Secretary for Administration, and membership of the Committee comprises the secretaries of each and every one of our 13 policy and resource bureaux. That, ladies and gentlemen, testifies to the importance we accord to addressing climate change. Today, the Committee continues to co-ordinate the actions of our various bureaux and departments in combating climate change. The Committee has set an ambitious target - a 65 to 70 per cent reduction of our carbon intensity by 2030, using 2005 as the base. This is equivalent to an absolute reduction of 26 to 36 per cent of Hong Kong's carbon emissions, and will result in a per capita emission reduction from about 6 tonnes to 3.3 to 3.8 tonnes. To achieve this ambitious target, we are adopting a multi-pronged approach. We will, for example, gradually replace most of our coal-fired generation units with cleaner energy sources. We will also encourage the development of renewable energy and implement an energy-saving plan to promote energy efficiency and green building advances throughout Hong Kong. Furthermore, we will improve public transport and promote walking. We will strengthen the climate readiness of the city as a whole. That includes cooling the city through such measures as landscaping and wind-environment design. The promotion of a "use less, waste less" culture is also crucial to achieving low-carbon living. To that end, we will enhance public education on sustainable consumption and waste reduction, implementing a municipal solid-waste charging scheme to encourage behavioural changes. All this, and much more, are set out in the "Hong Kong's Climate Action Plan 2030+" published last year. I am proud of the actions Hong Kong has taken, the plans in place, but clearly we cannot do it alone. We live today in a global village, inter-connected in trade transactions, financial services and, of course, the Internet; inextricably linked, as well, by threats from climate change, dwindling resources, environmental degradation and much more. These growing concerns are beyond the resources or the ability of any one country or economy to confront and conquer alone. Just as these challenges respect no borders, so, too, must our solutions embrace greater co-operation across political, economic and social boundaries. All of us - governments, businesses, academia, research institutions and civil society in general - have a shared responsibility towards the well-being of our planet and everyone in it. Indeed, one of the 17 Sustainable Development Goals calls for actions to strengthen the means of implementation and revitalise the global partnership for sustainable development. 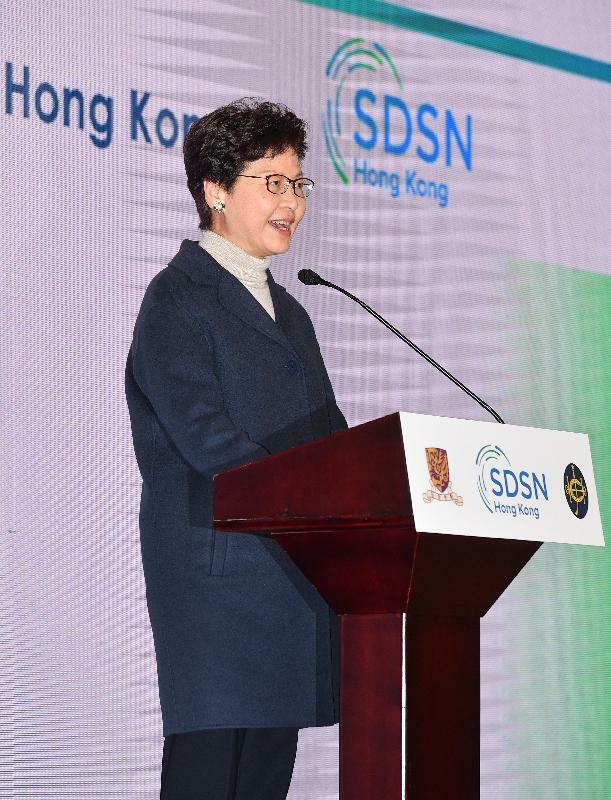 I am therefore very pleased with the alliance between the Chinese University of Hong Kong and the Hong Kong Jockey Club Charities Trust in launching the Sustainable Development Solutions Network Hong Kong. It will connect our academics, scientists and stakeholders with a global network for the exchange of scientific and technological knowledge, for joint research and for the development of innovative ideas and practical solutions for sustainable development. Such connection is set to benefit Hong Kong, other members of the Network, and the sustainable development of the world. I wish the Network and the newly launched Hong Kong chapter every success in their future endeavours. Before I close, I would like to welcome Professor Jeffrey Sachs to Hong Kong to officiate at this ceremony. I look forward to his keynote speech which I am sure will provide much insight for sustainable development. I also wish you a pleasant stay in Hong Kong. And for the other distinguished guests, I wish you all a fruitful afternoon, and a very prosperous 2018. Thank you very much.